As Sure as the Rain, Silver Winner by the International Independent Film Awards in Los Angeles. I co-wrote the script and co-edited this feature-length essay film by artist and filmmaker Nick Stewart. Music by Nils Frahm. Now playing at Tao Films. The activist and thinker Dougald Hine wrote this. Planetebd.com 25 Feb 2015. Full review by Sarah Dehove, here. First page of BODOI. 25 Feb 2015. Full review by Laurence Le Saux, here. A radio review that starts at 1.24.00 min- La Radio JET FM de Nantes, Nov 2014. Listen here. Mes Premières Lectures. Full review by Nelly Olson, here. 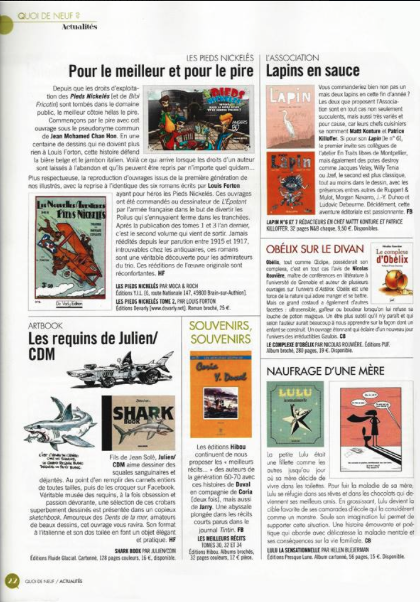 Canal BD, Oct/Nov 2014. Full text here. Dbd Magazine, Dec 2014/Jan 2015. Full text here. “Helen manipulates language, beauty and cruelty in a spine-chilling way. Her short story De donde vuelan los pájaros (On Where the Birds Fly) is mind-blowing. It combines a world full of pain and fantasy that creates in the reader a sense of incomparable effect”. Dr. Susana Arroyo-Furphy. Linguistics and Hispanic Language, UNAM Mexican Autonomous National University. “The short story is superb. Her prose is forceful and frank. She has both elegance and cheerfulness, demanding a competent reader for a thoughtful reading. Really magnificent.” Publisher Palabras y Plumas Editores. “Mexican artist and writer Helen Blejerman has been commissioned by The Institute for Lifelong Learning (Department of Hispanic Studies) at Sheffield University and Radio Sheffield Live to write more than a hundred original ‘Calaveras’ for the Mexican Day of the Dead in Sheffield… They will be about the life and death of Mexican singers, poets, nature, animals and flowers, written in Spanish and broadcast in English in Radio Sheffield Live. The Mexican Day of the Dead is a colourful festival dating back to the Aztecs and celebrated on November 1 and 2.” The Sheffield Telegraph (Sheffield United Kingdom, 28th of October 2011, extract). Writer and associate lecturer in the Fine Art Department at Sheffield Hallam University- Helen Blejerman, launched Proyecto Calavera, a cultural-gastronomic product which includes a skeleton biscuit and a mini book with literary ‘calaveras’. Thus various Mexican characters from poet and nun Sor Juana up to wrestler ‘El Santo’ will be known in this city. ‘What I want to show with my ‘calaveras’ is what we are, a Mexico of thinkers and ‘feelers’, Helen said… Radio Sheffield Live will devote a two-hour special to Proyecto Calavera where the verses will be translated and a cultural explanation of the characters will be given.” Yanireth Israde. Reforma Newspaper (Mexico City 2nd November 2011, extract). ‘In England and the world it draws attention that we speak very casual with the Death, that we put a hat on it, that we make it sugar and we eat it, said Helen Blejerman, Mexican artist that has been based in Sheffield for five years, a city where remembering the dead is far from being a party. Octavio Paz, Jaime Sabines, Frida Kahlo, Diego Rivera, Juan Rulfo, José Guadalupe Posada, Mauricio Garcés, Capulina, Chespirito, the canals of Xochimilco, the flower of Cempazóchitl and native languages such as huasteco, maya, nahuatl and Zapoteco, are some of the protagonists of the rhymes that are characterized by humor and mockery. For the short stories writer, also these characters reflect the popular culture of the country, its rich literary and artistic values and above all, the historical ‘weight’ of the celebration of the Day of the Dead that in few countries takes as much relevance in customs and traditions. Sonia Ávila. Excelsior Newspaper (Mexico City 1st of November 2011, extract).